In the past couple of days a variety of pictures have surfaced online showing what appears to be a reversible USB cable intended for the iPhone 6 and other Apple products due to be launched this fall. If true, then this would be cause a lot of users to breathe a sigh of relief since the correct insertion of the USB connector into notebooks/PCs is a rather mundane problem that we still have to face. And it’s due time someone solved it already. Well, according to a patent filed at the U.S patents office, Apple has been interested in the solution for this. Spotted by appleinsider, the patent filing goes by the title “Reversible USB Connector with Compliant Member to Spread Stress and Increase Contact Normal Force.” The filing deals with a ‘Type-A’ plug that features a double orientation design and is 180 degrees symmetrical. However before you get all to excited, the filing comes with a catch. Apple Patent For Reversible USB Cable Spotted At Patents Office – However It Is Not Compliant With USB Standards. The Type-A design that I mentioned above for the patent filed by Apple is not compliant with USB standards. This could and probably will cause Cupertino to not ship such cables/plugs with its future devices. Apple notes the difficulties that users face when using current USB cables and the patent has been filed to address this issue. “Users may incorrectly insert a plug connector into a corresponding receptacle connector, which may potentially result in damage to the connectors and/or user frustration,” the filing states. However before you give up all hope for future reversible USB connectors, it should be kept in mind that the USB Compliance Committee does have an approved connector which supports reversibility. Type-C is authorized by USB but the design specifications for it are completely different than what Type-A requires. 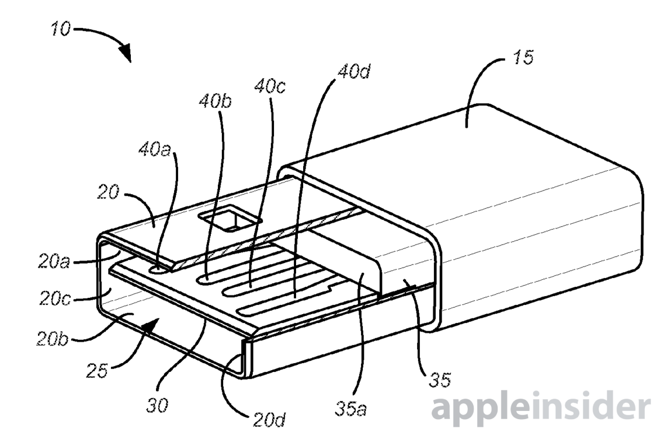 The reversible Type-A connector patent was filed by Apple this February meaning that the company is showing interest in developing a reversible cable for it’s upcoming devices. The question of whether the iPhone 6 will be in those devices will be answered this September.